With 18 unsolved cases, India has landed at the 14th position, alongside Somalia, Syria, Iraq, Pakistan and Bangladesh. India also, as it has in the past, refused to participate in UNESCO’s impunity accountability mechanism. New Delhi: Even as the international diplomatic fracas that has erupted over the murder of Washington Post journalist Jamal Khashoggi continues to dominate headlines around the world, the Committee to Protect Journalists released its Global Impunity Index on Monday titled “Getting Away with Murder: CPJ’s 2018 Global Impunity Index spotlights countries where journalists are slain and their killers go free”. In its eleventh report, which ranks states with the “worst records of prosecuting the killers of journalists”, CPJ states that “a lack of justice in the murders of journalists creates an entrenched climate of censorship”. “In the past decade, at least 324 journalists have been silenced through murder worldwide and in 85 percent of these cases no perpetrators have been convicted. It is an emboldening message to those who seek to censor and control the media through violence,” the report reads. The Impunity Index is released annually to mark the International Day to End Impunity for Crimes against Journalists on November 2. CPJ calculates the number of unsolved journalist murders as a percentage of each country’s population. For the index released this year, CPJ examined journalist murders that occurred between September 1, 2008, and August 31, 2018. At the top of the list for the fourth year in a row is Somalia with its dismal record of convicting perpetrators and 25 unsolved cases, followed by Syria, Iraq, South Sudan and the Philippines. The report clarifies that all 14 of the countries have appeared on the index at one point or the other since CPJ began to compile the list in 2008. CPJ’s annual Impunity Index identifies countries where journalists are murdered regularly and governments fail to solve the crimes. India has landed at the 14th position with 18 unsolved cases. In all, it has been on the list 11 times and was ranked 12th in 2017. In its 2017 report, CPJ had said that since the early 1990s, 27 journalists had been killed “with complete impunity” in India. India also refused to participate yet again in UNESCO’s impunity accountability mechanism, which requests information on the status of investigations into killed journalists. In fact, for the past two years, India has ranked among the countries with the highest number of journalist deaths. In 2016, the International Federation of Journalists listed India as the eighth most dangerous country for journalists. In March, three Indian journalists were killed in deliberate hit-and-run accidents: Sandeep Sharma in Madhya Pradesh, who had been investigating the powerful sand mafia in the state, and Navin Nischal and Vijay Singh in Bihar were all killed within the span of 24 hours. Among those killed in recent years was Gauri Lankesh, whose death truly shook up the media and the country. 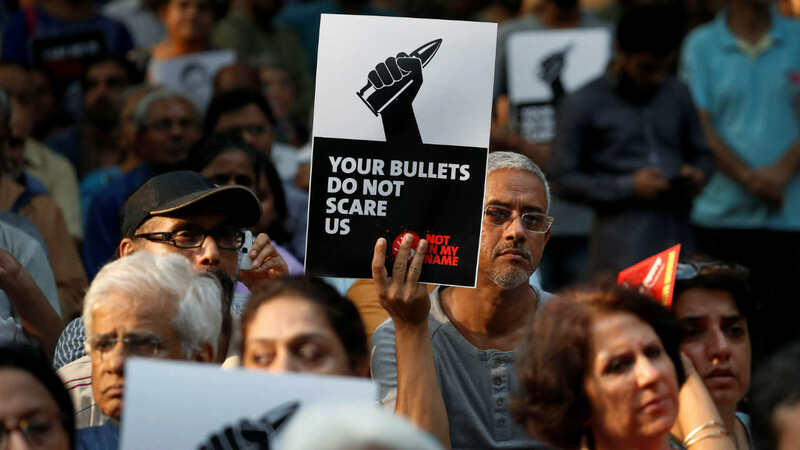 A veteran journalist and editor of a Kannada-language newspaper, she was fatally shot just outside of her home in Bangalore in September 2017 after she published reports critical of Hindu extremists. At the time of Lankesh’s death, Reporters Without Borders had said that journalists in India “are increasingly the targets of online smear campaigns by the most radical nationalists, who vilify them and even threaten physical reprisals”. “Impunity thrives in conflict environments, where powerful actors often use violent intimidation to control media coverage, while weak-to-nonexistent law and order increases the likelihood of attacks,” CPJ had said in 2017’s report. Pakistan, which is at No. 9, has also featured on the index 11 times; it too has 18 unsolved cases. This year, Afghanistan and Colombia made a reappearance after a few years. In Afghanistan, nine journalists were among at least 25 people killed in twin bombings in Kabul. One BBC journalist was also killed in a separate incident in the eastern province of Khost, making it the deadliest day for media workers in Afghanistan since the fall of the Taliban. Colombia made its way back on the list after alleged drug traffickers kidnapped an Ecuadoran news crew near the border and murdered them in Colombian territory. The three men were kidnapped investigating heightened violence in Esmeraldas, a province on the Ecuadorian side of the 585-km border. “CPJ defines murder as a deliberate attack against a specific journalist in relation to the victim’s work. This index does not include cases of journalists killed in combat or while on dangerous assignments, such as coverage of protests. Cases are considered unsolved when no convictions have been obtained, even if suspects have been identified and are in custody,” the report reads.